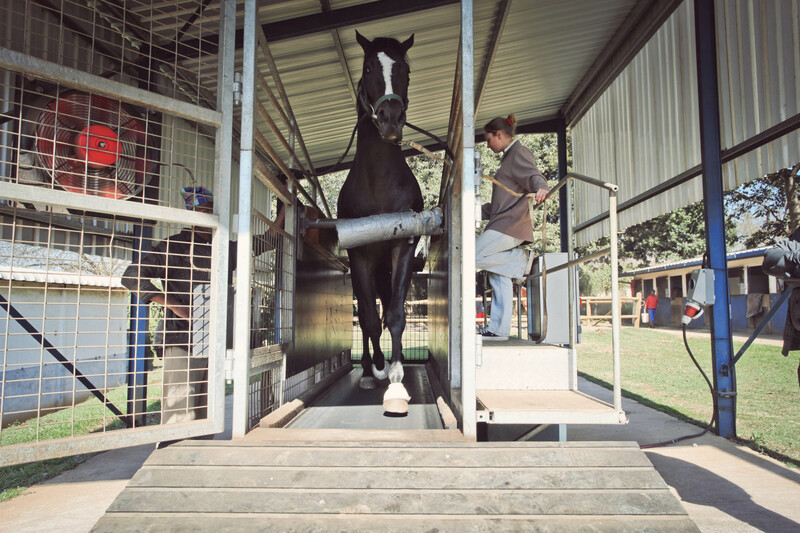 The Horse Treadmill / Equine treadmill comes fitted with a fully functional touch screen computer which helps you track your horses exercise routine, speed, heart rate, elevation/incline, timer, distance and total running time. The main advantage of our Horse Treadmill is that the horses are running on eight airbags, which are mounted underneath the floor of the Horse treadmill. These airbags absorb and disburse the impact from the horse’s legs and hooves. This is exactly the same way as top running shoes. Thus the saying, “Running on Air”. This method also gives the belt on the Horse Treadmill longer life than any other Treadmill. Being able to exercise horses in all weather conditions. It will assist horses who are difficult to load into pens. Our Horse Treadmill comes fitted with a fully functional touch screen computer, with various safety mechanisms. Low level switch for silicone oil. Silicone oil is sprayed onto the belt through an electric pump operated via the computer. Clogging indicator for filter on hydraulic pump. (This will warn you on the screen when to change your pump oil filter). Clogging indicator on return line filter. Air pressure switch. (you will not be able to start the treadmill if the air pressure in the airbags is too low). We have also featured a safety device, that if there is a power failure, the treadmill would go into freewheel mode and not stop dead. The total distance the horse has run during his training session. Total running hours regarding servicing. (Every 500 hours, you will be notified that the treadmill filters needs to be changed). Elevation: 0 – 7 degrees . Speed: 0 – 45km/h . Catwalk for operator, with handrails. Front and Rear chest bar, fully padded. Made from steel and is fully galvanised. Safety Valve for power cuts. Electrical lubrication pump for belt. All our side panels are made from 15mm black polyethylene, which is easy to keep clean and withstands all weather. The main advantage of our Treadmill is that the horse is running on eight airbags, which are mounted underneath the floor of the Treadmill. We designed this system on the same theory as running shoes. This disburses the impact from the horse’s legs through the airbags. This is kinder on the horse’s joints and extends the belt life. We have presently supplied the below Top South African , Mauritius and UK trainers with our Treadmill.